The UDOT Citizen Reporting Program enlists volunteers to report on current road conditions along specific roadway segments across Utah. The volunteers can be UDOT employees, law enforcement, truck drivers, plow drivers, experienced commuters, or other volunteers. The long term goal of adding Citizen Reporters to UDOT’s weather operations road reporting is to supplement current condition reporting on segments where drivers are already traveling. 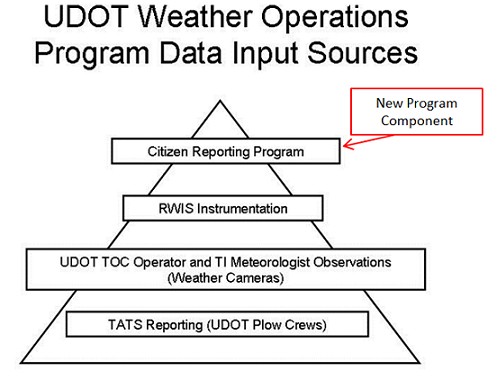 How does UDOT compile all of the incoming data and determine the appropriate road/weather conditions? UDOT has a sophisticated network of Road Weather Information Systems (RWIS) deployed throughout the state. These RWIS units collect road and weather data and transmit the data back to the UDOT Traffic Operations Center (TOC). Meteorologists at the TOC use this information to verify the conditions seen on atmospheric models. UDOT also receives valuable road/weather information from its plow drivers, and with the launch of the Citizen Reporter Program, trained volunteer reporters. All of the incoming data is compiled with carefully crafted logic to determine the condition of the road surface. Reports from plow drivers, law enforcement and other experienced reporters may be utilized in a different way than volunteer citizen data, however all data is immensely valuable and helpful in determining the condition of the road surface. How do I become a UDOT Citizen Reporter? In order to become a UDOT Citizen Reporter, you will need to complete a brief training (either online or in person), take a short quiz and complete a sign-up form. The training takes approximately 30 minutes. Once a volunteer has completed these steps, they will be provided with a login and PIN, and can begin submitting reports. Reports are submitted through the UDOT Citizen Reporting app, downloadable for Android and Apple devices from the iStore or Android Market. YELLOW Moderate Minor/intermittent weather related road concerns anticipated Monitor 511, UDOT Traffic Web page and NWS Weather Forecasts. * Click on a column name to sort the data by that column. Click on the same column a second time to reverse the order. How does a road weather forecast differ from the forecast I see on the news at night? A road weather forecast only concentrates on weather that impacts travel. For example, 3 inches of snow might be forecast to stick on the grass, but roads may remain wet. RWIS stands for Road Weather Information System. UDOT maintains a network of RWIS weather stations across the state of Utah. RWIS stations have atmospheric sensors, road sensors and cameras. These instruments measure air temperature, wind speed and direction, precipitation, road temperature, road surface condition, and other variables. What do you do with the information you collect from RWIS sites and how does it help me travel? RWIS stations provide critical information to a team of UDOT meteorologists and plow crews to help keep roads free of snow. RWIS stations also help inform the public of what the road conditions are like around the state. Where can I get forecasted road weather impacts from UDOT? UDOT provides road weather forecasts in 5 different locations. On UDOTTraffic.utah.gov  in the top center of the page click "Road Weather"
The "Current Conditions" tab (October 1 ‐ March 31) has updated road conditions on 141 segments of Utah's roads. The "Road Conditions Forecast" tab is updated by meteorologists at the TOC to help motorists know what to expect for three 6 hour time blocks on 63 segments of Utah's Interstates and Highways. Download the free "UDOT Traffic" app for Apple or Android devices. Follow UDOT Traffic on Twitter. What is a "Road Weather Alert"? A Road Weather Alert is a road weather forecast of expected statewide storm impacts to Utah's roads. Road Weather Alerts are issued before and during weather systems that will/are affecting travel on Utah's roads. How do I read the weather symbols on the UDOT Traffic app? Sunny, with a high near 65. Calm wind becoming southeast 5 to 8 mph in the morning. Sunny, with a high near 74. East southeast wind 5 to 7 mph becoming south southwest in the afternoon. Sunny, with a high near 48. Light and variable wind becoming south southwest 5 to 10 mph in the morning. Sunny, with a high near 67. Northwest wind around 5 mph becoming calm. Sunny, with a high near 73. Calm wind becoming south 5 to 8 mph in the morning. Sunny, with a high near 70. Calm wind becoming southwest around 6 mph in the afternoon. Sunny, with a high near 75. Southeast wind 3 to 6 mph. Sunny, with a high near 78. South southwest wind 3 to 7 mph. Sunny, with a high near 73. South southwest wind 5 to 8 mph becoming calm. Sunny, with a high near 83. East wind around 5 mph becoming calm in the afternoon. Sunny, with a high near 78. South wind 3 to 7 mph. Sunny, with a high near 72. North northwest wind around 5 mph becoming calm in the morning. Sunny, with a high near 70. Calm wind becoming south southwest 5 to 7 mph in the afternoon. Sunny, with a high near 77. South wind 3 to 8 mph. Sunny, with a high near 76. Light and variable wind becoming south 9 to 14 mph in the afternoon. Sunny, with a high near 72. West southwest wind 5 to 9 mph becoming calm. Sunny, with a high near 83. Calm wind becoming northeast 5 to 7 mph in the afternoon. Sunny, with a high near 71. North wind 5 to 10 mph becoming south southeast in the morning. * Click on City column name to sort the data by that column. Click on the same column a second time to reverse the order.